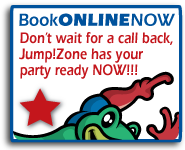 Jump!Zone Oklahoma City - Oklahoma's #1 Inflatable Party & Play Facility! Come see our NEW INDOOR Playground! 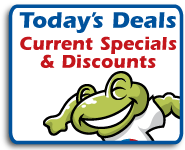 Zip line, wave slides, ball shooters and much more! 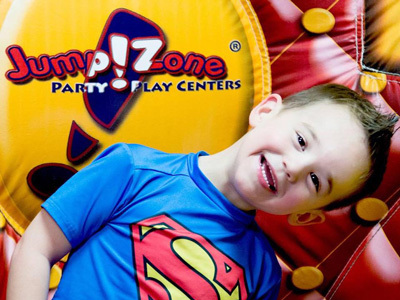 Come experience why Jump!Zone is Oklahoma's #1 Inflatable Party & Play Center! 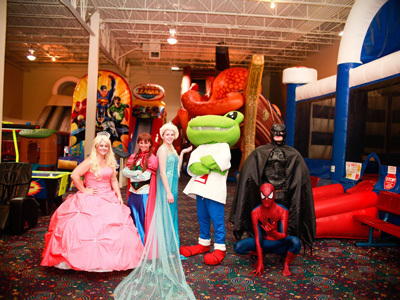 We offer 7 large inflatables and a Toddler area for ages 4 & under! 5 private party rooms including a Princess room! To book the princess room select the SPECIAL option when checking out. Check out our arcade room where you can WIN Prizes! We are available for birthday party's, princess party's, tea parties, baby showers, team parties, school field trips, daycare outings and much more! Call for group rates! No Outside FOOD or DRINKS. Parties can bring in Cake, Ice Cream and Decorations. Outdoor Play....Inside! Great Healthy, Active Exercise In A Climate Controlled Areana! The giant Kraken is pulling under the 26 foot tall ship which has super steep dual slides. The Justice League characters guard the obstacle challenge ending in a super fast slide. Scooby Doo is an open playground with obstacles and slides. 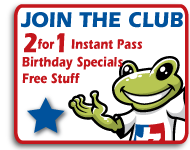 Indoor Playground, wave slides, zip line, ball shooters and much more! Huge inflatable basketball court bouncer. Huge colorful 18 foot slide! Cafe serving delicious food and beverages! Relax in our massage chairs! Locker Rentals for your belongings! Arcade area to win tickets for prizes!